Integrate MELPe DTE into PC-104 form factor. 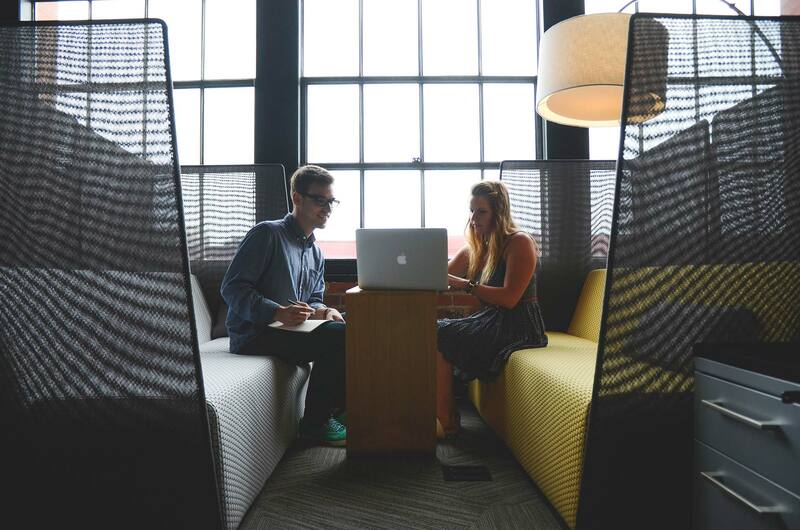 You can start working with MELPe today. No need to waste time and money on development and integration of MELPe software into you network channel. 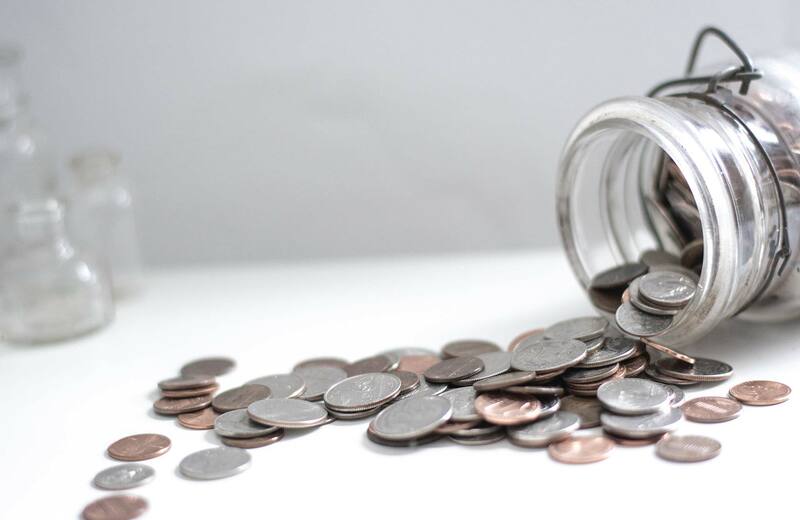 Start your testing and evaluation today! Compandent offers low-cost Data-Terminal Equipment (DTE) for interfacing vocoders (such as MELPe) with external Data Communication Equipment (DCE) such as modems or crypto devices. Compandent’s Flexible-Link for EXternal Instrument using RS-232 (FLEXI-232) or RS-422 (FLEXI-422) is a low-cost card that can be used as DTE connected to various external devices such as modems or crypto device using RS-232 or other protocols. It is easy to use, just plug it and play, and comes with optional Push-To-Talk (PTT) switch, and Smart Lithium-Ion Battery for your convenience. 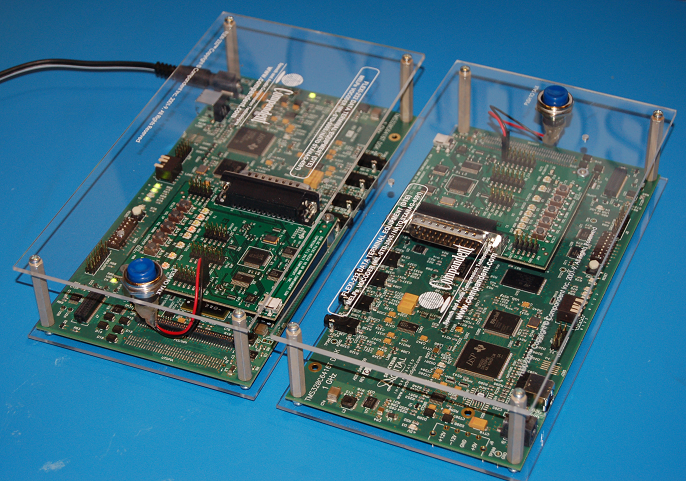 It is based on Compandent created testbed device (MELCODER a.k.a. the NATO “gold standard” reference hardware for STANAG-4591) utilized by the NATO's test-laboratory as a part of the MELPe standard adoption process. 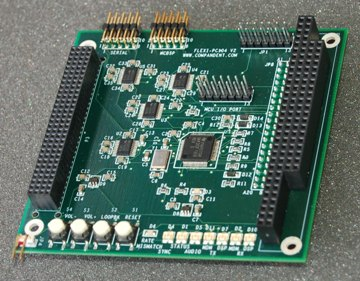 The FLEXI-232 board, illustrated in Figure 1, may be mounted to DSK board (such as the DSK5416, DSK5510, DSK6416 and various OMAP, such as OMAP1xx, OMAP2xx, OMAP3xx, OMAP4xx, and L-13x), or PC-104 DSP board that runs vocoders such as MELPe, G729, G723.1, etc.. The FLEXI-232 is an extremely versatile board that can be programmed to handle any required standard or customized communication protocol (beyond what a typical DSP may be capable of) including MIL-STD-188-114, RS-232, RS-422, RS-423, USB, TCP-IP Ethernet, 802.11b/g Wireless, etc.. It also has user friendly control and set-up interface. In addition, the FLEXI-232 has general purpose I/O lines that can be customized to your special needs. It can be also delivered as a standalone portable device in appropriate enclosure (Figures 4 & 5 below), and optional Smart Lithium-Ion Battery. Compandent's specially developed sample C++ program is also available for developing your own VoIP application. Figure 1.a Compandent's MELPe FLEXI-232 card for interfacing with external devices such as modems. (c) All rights reserved. Figure 1.b Compandent's MELPe FLEXI-PC104 card in PC-104 form. (c) All rights reserved. Block diagram of voice via DTE and modem / DCE system is illustrated in Figure 2.a, and VoIP application example Figure 2.b. 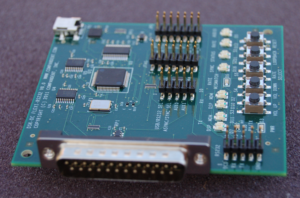 Compandent offers such a low cost MELPe-DTE that can interface with Rockwell-Collins MDM-3001 modem for example (Figure 3). Figure 2.a Block diagram of MELPe voice via FLEXI-232 DTE and modem / DCE system. (c) All rights reserved. Figure 2.b Block diagram of MELPe VoIP system example using FLEXI-232 DTE. Compandent's specially developed sample C++ program is available. (c) All rights reserved. Can interface with any required standard or customized protocol, synchronous and/or asynchronous (serial RS-232, RS-422, RS-423, USB, TCP-IP Ethernet, 802.11b/g Wireless, etc. ), and perform processing for networks such as GSM, CDMA, TDMA, 3GPP, 3GPP2, etc. Form factor: OEM board, PC-104 (plus) form, or Standalone portable device with optional high quality enclosure (see Figures 4 & 5 below). Metal enclosure dimensions are 47 x 120 x 235 mm = 1.85" x 4.70" x 9.25", and about the same for the PlexiGlass economy enclosure. Develop your own VoIP application using helpful specially developed sample C++ program by Compandent. Optional connectors such as DB25, DB9, Ethernet, Wireless 802.11b/g antenna module, etc. Various DSP such as c5416, c5510, c6416 OMAP, DaVinci etc. Customized System solution: Cost-effective board and software for customized communication link to your modem or other equipment. Figure 3. 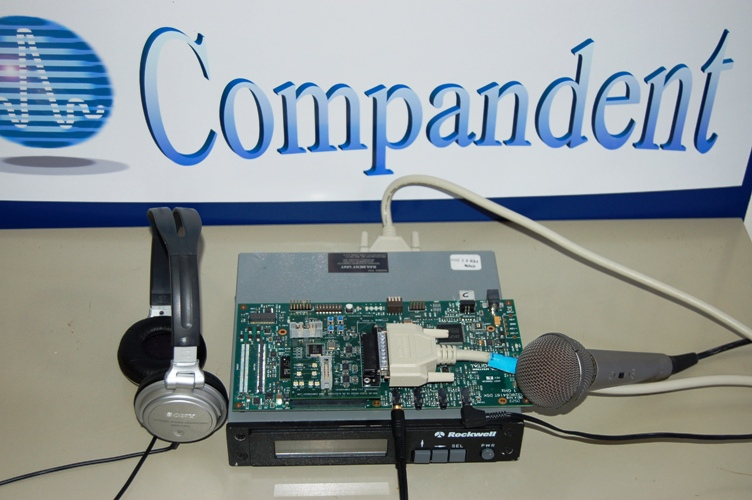 Compandent's MELPe DTE connected to Rockwell-Collins' MDM-3001, microphone and headphone. (c) All rights reserved. Figure 4. Compandent's MELPe DTE in high quality custom metal enclosure and PTT switch. Metal enclosure dimensions are 47 x 120 x 235 mm = 1.85" x 4.70" x 9.25", and about the same for the PlexiGlass economy enclosure. (c) All rights reserved. Figure 5. 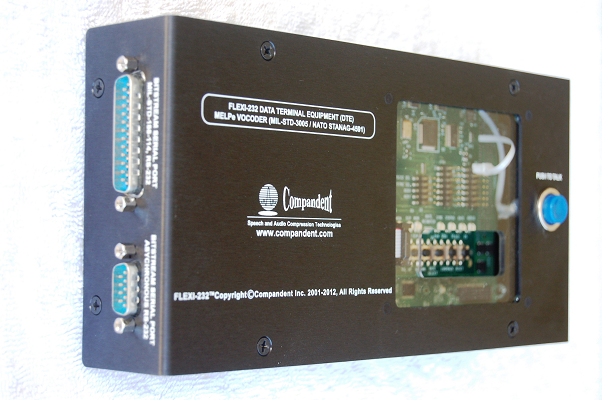 Compandent's MELPe DTE in PlexiGlass plate enclosure and PTT switch. (c) All rights reserved. 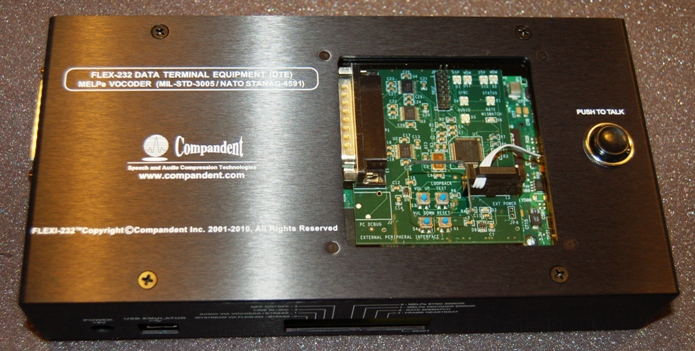 Compandent Inc. has participated in the research, development and implementation of the Enhanced Mixed-Excitation Linear Predictive (MELPe) vocoder, and utilized its savvy expertise in speech coding and DSP to take the MELPe to the next level and generate low-cost system solutions needed by the industry. In addition, Compandent provides various software and hardware related to the MELPe vocoder. Compandent also provides MELPe related DSP software & hardware in various COTS form factors and platforms, including multi-channel & multi-thread POSIX (Portable Operating System Interface) compliant software running on various platforms such as Unix, Linux, Windows PC, MacOS, etc.. Such implementations are suitable for applications such as PDA, pocket PC, laptop, cell-phones, VoIP, satellite communications, secure voice, secure radio, Software Defined Radios (SDR) or software-programmable radio, STE (Secure Terminal Equipment), JTRS and MIDS terminals. Defense Contractors, please also refer to: Note to Defense Contractor Management and Engineering. Please note: Compandent owns intellectual property (IP) in the official (standard) MELPe implementation, and any of its derivatives (see for example USCO certificate of copyright registration numbers: TX0006703781 (postfilt.asm), TX0006845325 (lpc_lib.asm), TX0007161044 (lpc_lib.c), , and many more. Any party intending to develop products based on MELPe should contact Compandent as well as other IP holders regarding licensing.